Malaysia Athlete Create Olympic History At London2012 – footsteps……..
First Yahoo listed Malaysia Uniform as among the worst during the contingent march past at London2012 Opening Ceremony. 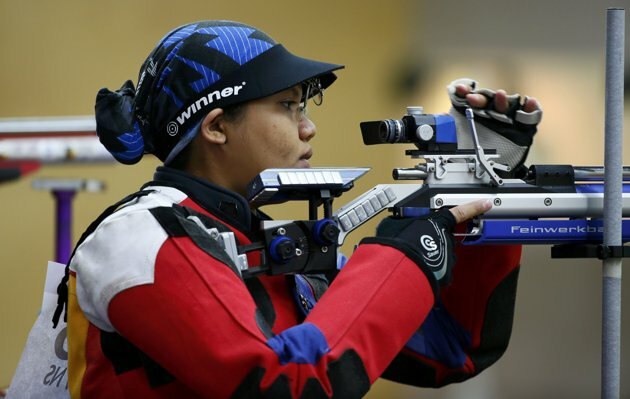 Then Malaysia again caught their attention when Nur Suryani Mohammed Taibi shoots at the Royal Artillery Barracks at Woolwich in South East London. We have known the result of her participation in the 10m Air Rifle. She scores 392 points and ranked 34 out of 56 participants. Even though she did not make it into the last eight for the Finals, she did get some attention especially from Yahoo Sports because of her condition. As we all know she is in her eight’s month pregnant and maybe she had created a history not only for herself or Malaysia but also Olympic history to date. Not only is Taibi one of the few pregnant women in Olympic history, but she is also the most pregnant woman in Olympic history. Yahoo wrote; LONDON – Her baby kicked inside her – arms stretching, legs flailing – so Nur Suryani Mohammed Taibi clutched her rifle and cooed what any pregnant woman should say while standing in the Olympics with gun in hand. Yahoo concluded : The best story of these Games was gone before they had barely started. Next Post One Archer Move On To 1/16 In Men’s Individual.